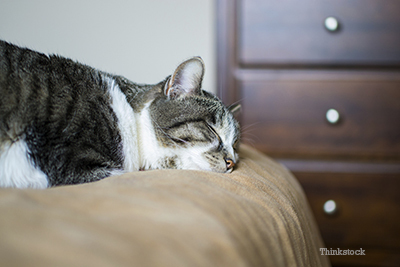 It’s true: our feline friends can get colds, too! As is the case with humans, the culprits to blame for these nasty colds are bacteria or viruses, sometimes both. Less commonly, Mycoplasma spp. (bacteria) or a feline retrovirus, such as FIV or FeLV, are contributing factors in an upper respiratory infection. Bacteria and viruses are very contagious and are present in the saliva and discharge produced by the eyes and nose. Healthy cats can get infected when they come into direct contact with a sick cat. Cats with retroviruses are especially vulnerable to the contagions, both through direct contact or indirect contact with contaminated objects. Unfortunately, some of the aforementioned diseases are still present in seemingly recovered cats (carriers) and are unknowingly passed on to other cats. Mothers can also act as carriers, passing on infections to their litters. Cats that have contracted FVR are considered “chronic carriers,” meaning they will carry the virus for life and can become sick again in times of high stress (moves, new housemates, babies, etc.). About half of the cats infected with FVC will remain infected as carriers, sometimes for a few months after symptoms cease, and, in rare cases, for life. Sniffling, sneezing, clear to pus-like discharge from the eyes and/or nose, coughing and lethargy are common symptoms of an upper respiratory infection in cats. On examination, your veterinarian may also check for oral ulcers, sometimes caused by FVR and FCV. Generally, a fever, poor appetite, and lethargy accompany the more specific symptoms of a URI. Generally an infection will last for 7–21 days. There is an incubation period, the time period from point of infection to when clinical signs become apparent, of 2–10 days. It is thought that the incubation period is the time of highest contagion. Chronic upper respiratory infections require additional tests, such as radiographs to evaluate the lungs and sinuses, cultures of cells, and microscopic evaluation of discharge. Your veterinarian will determine the best treatment course for your cat, which may include specific prescriptions and possible hospitalization, depending on the severity of clinical signs. Increase humidity within your home—this can be done with a humidifier or by taking your cat into a steamy bathroom several times a day for short periods of time (15–20 minutes). Offer yummy, appetizing cat food—canned food usually smells better to cats and encourages eating. Clear the eyes and nose of discharge—wipe the eyes and nose with a moistened washcloth to remove discharge that accumulates throughout the day. Parents of children will tell you how difficult it is to keep their kids free from colds; it can sometimes be the same with our feline kids. But, as is the case with children, vaccination can protect your cat from the most common causes of and upper respiratory infection: FVR and FVC. Disinfection is another highly effective way of minimizing environmental exposure. In high- to minimal-risk situations, it is advisable to regularly disinfect shared items such as litter boxes, food bowls, and bedding. Preventing direct contact between cats is ultimately the best way to avoid infection. If you are bringing home a new cat that has come from a breeder or shelter, it is important to have her visit the veterinarian before introducing her to any cats you currently have. Keep in mind that your new kitty may not yet be showing symptoms, so limited exposure and diligence in cleaning and sanitizing is very important in the first 1–2 weeks after adoption. Humans are at low risk for contracting the diseases responsible for causing upper respiratory infections in cats. Most of these infectious agents are species-specific—affecting only the one species—and are not “zoonotic” (spread between species). B. bronchiseptica and conjunctivitis associated with C. felis can be a potential risk to people with lowered immunity. To prevent the chance of infection, wash your hands frequently and be watchful for signs of respiratory illness.